Usually people go on an early morning safari – around 6.30 AM - on the second day at Maasai Mara; that is the best time for sightings. We had however ruled that out, since we wanted Adi to complete his sleep. With no real hurry and the alarm time having accidentally changed from AM to PM, I overslept till about 8 AM (there is absolutely no possibility that Aamir or Adi will wake up before me on a holiday). Once up, I was quick on my feet and got Aamir and Adi ready in no time. Adi said good morning to doves and white browed robin-chats, flocking within the resort; and to the numerous hotel workers that he met on our way to breakfast. Robert was ready, waiting for us (since long I guess) and off we went on our safari. The day started with a pride of lions (obviously discounting the countless wildebeests that we saw before them). The lions were busy feeding on a wildebeest (so they do some work apart from resting), the feeding protocol being strictly followed – every body knew who their predecessors should be. However as we found out the real feast was somewhere else. Moving on, we saw a group of more than ten Ruppell’s griffon vultures and two marabou storks looking longingly at an ongoing feast (rather an after feast) where two chestnut brown lappet-faced vultures (named for the loose skin or lappets that hang from the red featherless head, Kiswahili tumbusi ngusha) were feasting on a wildebeest carcass (or whatever was left of it) with their massive greenish brown hooked bills. The Ruppell’s griffon vultures and marabou storks dared not get too near the biggies – in fact the largest, most powerful and most aggressive of the African vultures; the weaker ones were happy to patiently wait out their turns from a distance (not sure if they got a chance to taste the dead wildebeest eventually). Who would not hold the lappet-faced vultures in high esteem with their wingspan of 2.6 m and height of more than one metre? The broad wings are designed to allow long periods of gliding and soaring without wasting energy in flapping. Interestingly lappet-faced vultures having the first go at a carcass is often beneficial to the less powerful ones because the former can tear through the tough hides and muscles of large mammals that the others cannot penetrate. One of the rarest of the vultures, lappet-faced vulture is classified as vulnerable since only a small, declining population remains, owing primarily to poisoning and persecution, as well as ecosystem alterations (and so is the current population of Ruppell’s griffon vultures in decline). Anybody for a Veggie Sausage? We passed by a herd of elephants before we got to a pride of resting lions, the alpha male keeping his distance from the commoners. Aamir was almost bored with lions by then (Adi definitely was); so we did not hover near the spot too much. Not too far away, Robert pointed out a sausage tree to us, with its plentiful unusual fruits – very much like huge grey sausages - hanging from the tree umbrella. Each fruit can be up to 1m long and can weigh as much as 10 kg! Interestingly, these trees possess large, dark red and malodorous upturned trumpet like flowers which attract fruit bats that pollinate them. Location of the flowers by bats is thought to be assisted also by ultra sound echoes from the flowers that hang isolated beneath the canopy on long stalks. Both the fruits and flowers have many takers among animals and humans - for food and medicine. Beer is also made from the dried, baked and sliced ripe fruits - anybody for fermented veggie sausages? 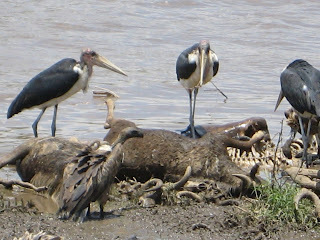 The plan for the day was to go to Mara river, near the western Trans Mara area of the forest. We wanted to see for ourselves from where the wildebeests, zebras and antelopes cross the river. We travelled through absolute flat plain terrain – the blue and white above meeting the green and brown below in one straight line of horizon. After around two hours (Adi had finished a nap by then), we reached a stone structure which demarcated the border between Kenya and Tanzania. There was nobody manning the forest border except for some grazing Maasai giraffes, with their continuous relaxed munching. Looking at giraffes, it always feels as if time has stood still; there never seems to be any bit of hurry in their bearing. We also saw the border between the Narok County Council and Trans Mara County Council controlled areas; to enter Trans Mara region would mean separate entry fees. The Trans Mara side is said to be less crowded, I wondered how the sightings would be from that end. I noted in my head – may be that is something to explore during the next opportunity at Mara. And then we saw the gushing river and crossed it too – not in the thrilling fashion the wildebeests do it, instead over a man made bridge. It is mostly not possible to see the wildebeests crossing over in action – unless you are a camped wild life photographer; as it is these days the crossing over usually happens at night. But it was not difficult to imagine the wildebeests arriving at the river in their tens of thousands, and gathering - waiting to cross, the grass beckoning on the other side. For days their numbers can be building up; and sometimes for no apparent reason, some would turn and wander away from the water’s edge. Eventually the wildebeests will choose crossing points – which are variable from year to year, unpredictable and may be multiple even for the same herd. Usually the chosen point will be a calm stretch of water without too much vegetation that can conceal predators (later while walking we saw some such spots). Occasionally though they will choose seemingly suicidal places (and be killed in hundreds), probably because crossing places are genetically imprinted in their minds. I have read that the river is approximately 20 m wide, but the width itself is not as dramatic as the steep banks of the river, from where the animals jump in their desperation and injure themselves before reaching the ground. Due to the sheer size and intensity of the charge, even crocodiles back away as the main body of the herd is passing, due to fear of being trampled to death. Although we did not see the crossing over, there was enough evidence to suggest what would have transpired there. Flocks of Ruppell's griffon vultures and marabou storks feeding on dead carcasses was a common sight. Giving them company were sacred ibises (held sacred by Egyptians based on mythical stories, Kiswahili kwarara), their white bodies contrasting with black heads, necks and tails; their long downward curved bills probing for both fresh fish and scraps of carrion. Back in the Kenyan side of the river, Robert stopped at a designated tourist spot. We took a short walk near the river with a wild life official. Apart from barely a glimpse of a baby Nile crocodile (Kiswahili mamba) who quickly ducked inside water since there were big hippos near by, there was no other crocodile in sight. According to our guide, all were cooling off under water on a hot day. Unable to sweat, they must thermo-regulate. They can stay underwater for extended periods of time since they don’t move much and therefore don’t expend a lot of energy; they have the ability to slow their heart rate, allowing them to hold their breath. Usually they can hold their breath from 4 - 15 minutes but can remain underwater for two hours if needed and if they aren’t stressed! When submerging under water, they close their ear and nostril flaps. They are also able to see underwater due to a transparent lid (third eye lid or the nictitating membrane) that closes over their eye for protection. I was hoping to spot some of them, but I guess it is better to stay far rather than near to these 200 kg+ predators (our guide said big ones weigh 1000 kg) with jaws flashing 66 sharp teeth. The hippos (Kiswahili kiboko) in contrast were very much visible at the river cooling off their large barrel shaped bodies, either in the water or on the bank mud – saving their energy to graze during night time on their surprisingly short legs (the water in which they live reduces the weight burden, so they don’t really need long legs). Hippos spend up to 16 hours a day submerged in rivers and lakes to keep their massive bodies cool under the hot sun. Their eyes and nostrils are located high on their heads, which allows them to see and breathe while mostly submerged. The process of surfacing and breathing is so automatic for them that even a hippo sleeping underwater will rise and breathe without waking. Like the elephant, the hippo is another of nature’s jumbo sized vegetarians (third largest land mammal after elephant and white rhino). It was in fact considered a female deity of pregnancy in ancient Egypt; no wonder since it does look ever pregnant. But unlike the elephant, the hippo is ugly and not friendly at all, on the other hand it is considered to be one of East Africa’s most dangerous mammals (make no mistake despite its stocky shape and short legs, it can easily outrun a human for short distances and often attacks without provocation). In the blazing African sun, all of us could do with some in house skin moistener and sun block (and germ block too) – they have a ready supply which their skin secretes from time to time. Adi felt free at last after more than two hours of captivity in the car and he was not the one to waste this walking opportunity – and to be independent of us. He refused both of our offers to carry him or hold him. When it was time to go back to the parking area, he just would not come with us. I intentionally left him behind and started walking, so that he would follow me. But that was enough to get me a scolding from a passing wild life official: “mamma don’t leave mtoto behind”. Pointing to an East Asian tourist who had two docile bigger babies holding on to his hands, he advised me “hold your baby’s hand like he is holding for his babies.” Fuming inside, I picked up Adi – who did not like the drift of the conversation at all, but one look at my face and he decided that it was better to surrender. It was a picnic spot and Robert had packed lunches for us from the resort. He even had some blankets to spread on the ground. Sitting on the ground, we had a sumptuous lunch together (in fact we had to give away quite a lot of unopened yogurts and sandwiches to the wild life officials). Adi decided to fill himself (and mess himself up completely) with only butter; and when he was full, he turned his attention to feeding Aamir with it (he simply loves to role play as an adult feeding some body else). Dining near us was a group of tourists, who had come in a huge camper van equipped with a camping kitchen and an organising crew. I fantasised on the idea of experiencing a few days in it, but soon left the thought – certainly not an idea that can be considered by the mother of a two year old baby. Ignoring Adi's pleas of continuing playing in the picnic spot, we headed back towards the resort. We passed by a mobile tower camouflaged as a tree, its plastic pointed leaves standing out from the surrounding tropical tree umbrellas. Then we chanced upon a lilac breasted roller (Kiswahili kambu) – spotted by me – displaying its extraordinary bright colours from a bare tree branch, probably scanning the ground for grasshoppers or beetles. I do not think I have ever seen more colours in a single bird – a brilliant kaleidoscope of red, yellow, blue, greenish blue, green and violet (or lilac). Rollers get their name from their impressive courtship flight, a fast, shallow dive from considerable elevation with a tumbling motion, accompanied by loud calls. The species ranges more or less continuously throughout eastern and southern Africa, as a matter of fact it is the national bird of Botswana. Not too far away, I spotted a second lilac breasted roller - who knows may be the monogamous mate of the first one that we had seen. After a while, Robert attracted our attention to a movement on the ground and stopped the car. It was a black beetle with armoured body and short thick antenna rolling a big ball (which we thought was a stone), at least three times its size. It kept on rolling it more or less in a straight line in spite of the many hindrances it found on its way on the rough road – and once in a while climbing on the top to do a dance. On closer look, we found that it was actually pushing the ball with its long hind legs (instead of the fore legs), its head pointed at the ground in the opposite direction! On the lookout for “big” things, I never thought we will hit upon such an astonishing tiny sized phenomenon. 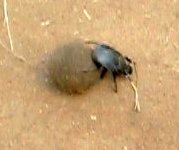 After my internet research, I now know that it was a dung beetle (also known as the scarab beetle) of the sub category roller (as opposed to tunneller and dweller); who are noted for rolling dung (no not a stone) into round balls to use as a food source or brooding chambers (where the female lays eggs). Using their sensitive sense of smell, they fly around in search of dung, preferably from herbivores (all of us are allowed our dietary orientations and do note that they do not require anything else to eat or drink, the food is nutrient rich in itself)! Sometimes dung beetles will try to steal the dung ball from another beetle (they have been given strong front limbs for digging and fighting), so the dung beetles have to move rapidly away from a dung pile once they have rolled their ball to prevent it from being stolen. Incredibly, some of them can roll up to 50 times their weight. Scientists are busy figuring out how the beetle stays on its course without looking where it is going. They believe that when a beetle climbs a dung ball four or five times its height, it gets a pretty good vantage point from which to correct any navigational mistakes. The dance of the dung beetle provides clues to navigation and could lead to more sophisticated light-weight robots in the future. And that is not all - there is a species of African dung beetle that navigates by the polarisation patterns in moonlight! We may turn our noses up at these creatures, but nature has actually entrusted them with a critical job role. Not only do they remove animal dung from land, but their activities reduce the number of dung feeding flies (hence hygiene automatically goes up and diseases go down) and enrich the soil – benefiting both animals and plants. Without them, the dung would harden and cover the ground, inhibiting the growth of grass and other plants. Ancient Egyptians thought very highly of this beetle, they related it to the revolving nature of the sun. Like many other insects, the (dried) dung beetle is used in Chinese herbal medicine. When it was finally time for us to move on, we found that the beetle was right in front of the car tyres. Robert got down and moved it (and also the dung ball) with a stick to one side of the road. The beetle did not realise that his intention was to help; instead perceiving him as a threat, responded by toppling over in typical beetle-like manner, continuously squirming its six legs. As expected, when it felt it was safe, it got back up; and immediately got back to its business of rolling. By this time, a bus full of tourists had arrived behind us; everybody straining their necks out to see what we were looking at. We moved on, leaving the beetle to bask in the admiration of its newly found audience. We passed by a papa ostrich before an olive baboon perched on a short tree greeted us, his troop mates scattered near by – the familiar but ever entertaining sights of scratching, tree climbing, jumping, running, sitting, walking on fours. Adi was especially thrilled to see a baby baboon riding on his mamma’s back passing just under his window, followed by another such mamma baby pair. As we moved on, the jungle opened up its trove of bounties – one after the other unfolding before us. Yellow-billed oxpeckers feeding on ticks on cape buffaloes, the fringed ears of the buffaloes hanging beneath their ‘C’ and mirror image of ‘C’ like horns. A female waterbuck (Kiswahili kuru) with its shaggy coat, sans the ringed horns of the male. A pair of long legged grey crowned cranes (Kiswahili ndegechai) showing off golden-yellow tufts on the head, bold white patches on the cheeks and red fleshy lobes hanging from the necks. Helmeted guineafowls (Kiswahili kanga) flaunting their bony crests over their blue heads and white dots all over their grayish black bodies. A bunch of white storks (Kiswahili korongo) with contrasting black wings and red bills. whereas a male bright red firefinch had its beauty to advertise. A male Speke’s weaver peeping out of a hanging pendant – one of the many nests displayed as part of an exhibition on acacia’s thorny branches; birds of the weaver flock always nestling together for protection (and yes, males sometimes do get hard jobs like weaving nests). An African paradise-flycatcher sitting in a totally different kind of nest – that in the shape of a neat deep cup (here the female chooses to share the workload of nest construction though). A tree deciding to stand at an acute angle for some odd reason – I can just go on and on. One of the stopovers that Robert had planned was at Keekorok Lodge resort, which has a hippo pool. The way to the hippo pool view point was through an extended platform built with planks. Used to playing safe, the gaps between these planks posed as a great challenge for our junior - he was instantly wary of stepping on it. Even when he agreed to walk on it, he did it only by holding my hand, at a little more than snail’s pace – though sometimes there was a speed burst. Resting at the view point, one could spend hours looking outside, enjoying the splendid views. The hippos were all inside the pool; with yellow billed storks, Grant’s gazelles, plains’ zebras giving them company from the banks. Robert had given us fifteen minutes time limit; so we started back accordingly, and we got an action replay of the coming in sequence on the platform. When we went back to the van, we found it taken over by a battalion of black faced black eared yellow brown forces (later identifed as vervet monkeys, Kiswahili tumbili). With the roof being up, two monkeys had entered inside. By the time we reached, one of them had opened our lunch boxes and had taken out a left over sandwich. Robert managed to shoo them away, the chain of events resulting in Adi being in a heightened level of excitement. The monkeys joined their friends outside – jumping from one tree to another swirling their long tails and plucking flowers with their black palms to eat; each jump causing a huge uproar in the tree and receiving a thumping applause from Adi! We had travelled a few kilometres when we found a lioness sitting right on our way. She looked very much in pain, and unable to sit for long, she reclined soon after. Not wishing to add to her discomfort any further, we decided to continue on our way via a little deviation from the blocked road – though I doubt if she had any respite from the ceaseless tourist attention. The skies now presented a rare picture – showers in the distance from white clouds mingled with black ones in the faint dusk light (on one or two instances we have been treated with a rainbow over the plains as well). Last stopover for the day was near a resting pride of lions – complete with males, females and babies – a fitting royal end to the day’s safari. I woke up to a cheerful morning after another night’s luxury in the luxury tent. We had already decided that we were not going on an early morning safari, it was better to rest to prepare ourselves - especially Adi - for the rocking return journey. Adi definitely preferred springing and sprinting in the open to being confined in the car for more than an hour. I shared his feelings, it felt lovely to take a stroll in the resort lawns, listening to the windy breeze as it passed by each tree and ruffled each leaf. We had a tour of the beautiful kitchen garden – all vegetables used in the kitchen were grown in house. As usual, there was enlightenment in store for me – I learnt that the herb dill was the same as soa leaf (as called in Hindi). It was time for kwaheri after awesome flora-fauna-filled two and half days. I was deeply thankful for the opportunity to be stationed in Kenya and to see what we had seen. Maybe in the next couple of years that we are based in East Africa, we can be back – and who knows try out something new like hot air balloon ride (pinching on the pockets though; and wild animals ten feet away certainly needs to be experienced first before their aerial view). I closed my eyes and imagined seeing from the top - thousands of wildebeests in migration led by zebras – that is surely something to come back for! Then there is Serengeti from Tanzania end, which covers more than 90% of the total Mara-Serengeti forest area – definitely that’s a travel plan to work on. Back in the car, some of the sorry statistics that I had read about Mara played in my mind - according to International Livestock Research Institute (ILRI) website, a study funded by the World Wildlife Fund for Nature (WWF) and conducted by ILRI between 1989 and 2003 monitored hoofed species in the Mara on a monthly basis, and found that that losses were as high as 95 percent for giraffes, 80 percent for warthogs, 76 percent for hartebeest, and 67 percent for impala – another instance of man conflicting with nature. Per Wikipedia, estimates of the African lion population was between 16,500 and 47,000 living in the wild in 2002–2004, down from early 1990s estimates that ranged as high as 100,000 and perhaps 400,000 in 1950. But damage was averted in least some quarter. In the Serengeti National Park, a proposed 50-kilometre (31 mi) road with tarmac touching the Serengeti, raised criticism from scientists who say that the road will disrupt the annual migration of the wildebeest, and that this disruption would affect predators such as lions, cheetahs and African wild dogs, as well as the grasslands themselves. In late June 2011, the Tanzanian government decided to cancel the Serengeti road plan due to this global outcry. One thing is for sure – it’s better to enjoy it while it’s still there. Good bye wilderness, I shall be back.